The administration and faculty are pleased to announce the Students of the Quarter for the third quarter. Please join us in congratulating these students and their families! Senior Blake Sellers is the son of Chad and Denise Sellers of Breese. Throughout his academic career, Blake has enrolled in college-preparatory courses, including English Composition 101 and 102 as a senior. Outside the classroom, he is a four-year member of the baseball team and Pep Club and a three-year member of National Honor Society. Finally, Blake is a member of St. Augustine Catholic Church, where he serves as an usher. Following graduation, Blake plans to enroll at Kaskaskia College and to earn a degree in business administration. Senior Alexis Patton is the daughter of Brian and Dana Patton of Bartelso. Throughout her academic career, Alexis has enrolled in numerous honors classes, including all the honors science courses. As a senior, in addition to Physics Honors, her courses include English Composition 101 and 102 and Pre-Calculus. For her academic achievements, she earned recognition as an Illinois State Scholar and received an award for Algebra I. Outside the classroom, Alexis is a four-year member of chorus, Future Business Leaders of America (FBLA), for which she serves as treasurer, Pep Club, and Sacred Brothers Sacred Sisters; a three-year member of National Honor Society; a two-year member of Spanish Club; and a first-year member of Peer Helpers and Student Ambassadors. For her achievements, she received awards for chorus and FBLA, and she will compete at the Illinois FBLA State Leadership Conference for the second consecutive year. In the community, she volunteers at the Cathedral Kitchen and Food Pantry and local blood drives. Finally, Alexis is a member of St. Cecilia Catholic Church, where she serves as a eucharistic minister and member of Catholic Youth Ministry (CYM). Following graduation, Alexis plans to enroll at Maryville University and to earn a degree in physical therapy. Junior Andrew Tasker is the son of Jamey and Jill Tasker of New Baden. Since his freshman year, Drew has enrolled in college-preparatory courses. Outside the classroom, he is a three-year member of the baseball and soccer teams and a first-year member of Student Council. In the community, he volunteers for Special Olympics basketball, football, and golf events, as well as their trivia fundraiser. Finally, Drew is a member of St. George Catholic Church. Junior Madeline Strieker is the daughter of Roger and Lisa Strieker of Aviston. Since her freshman year, Madeline has enrolled in college-preparatory courses. For her academic achievements, she received awards for Algebra I, Biology I, Health, Spanish I, and Theology I. Outside the classroom, she is a three-year member of the basketball and softball teams and a two-year member of National Honor Society. Finally, Madeline is a member of St. Francis Catholic Church, where she serves as a gift bearer, lector, and server. Sophomore Alden Moss is the son of Phillip and Kelly Moss of Breese. In both his freshman and sophomore years, Alden enrolled in the honors English and science courses. As a sophomore, in addition to Biology Honors and English II Honors, his courses include Algebra II & Trigonometry. For his academic achievements, Alden received awards for American Government, English I Honors, Geometry, Physical Science Honors, Spanish II, and Theology I. Outside the classroom, he is a two-year member of the basketball and golf teams and a first-year member of the Academic Challenge Team. Finally, Alden is a member of St. Dominic Catholic Church. Sophomore Sarah Lipski is the daughter of Frank and Regina Lipski of Highland. In both her freshman and sophomore years, Sarah enrolled in the honors mathematics courses. As a sophomore, in addition to Algebra II & Trigonometry, her courses include Biology Honors and Spanish II Honors. Outside the classroom, Sarah is a two-year member of Pep Club, St. Vincent de Paul Society, and Teens for Life; and a first-year member of the cheerleading squad, Power of Positive Students (P.O.P.S), Student Ambassadors, and Student Council. In the community, she volunteers at the Relevant Pregnancy Options Center dinner and for the Knights of Columbus #1580 Ladies Auxiliary. Finally, Sarah is a member of St. Paul Catholic Church, where she serves as a eucharistic minister, lector, and server. Freshman Jacob Patton is the son of Brian and Dana Patton of Bartelso. In his first year at Mater Dei, Jacob enrolled in all the available honors courses – Algebra I Honors, English I Honors, and Physical Science Honors. Outside the classroom, he is a member of the baseball and basketball teams. In the community, he volunteers at the Cathedral Kitchen and Food Pantry. Finally, Jacob is a member of St. Cecilia Catholic Church, where he serves as a member of Catholic Youth Ministry (CYM). Freshman Josie Przygoda is the daughter of Mark and Becky Przygoda of Breese. In her first year at Mater Dei, Josie enrolled in all the available honors courses – Algebra I Honors, English I Honors, and Physical Science Honors. Outside the classroom, she is a member of the marching band, Scholar Bowl, Science Club, and softball team. Finally, Josie is a member of St. Augustine Catholic Church, where she serves as a member of Catholic Youth Ministry (CYM), lector, and server. 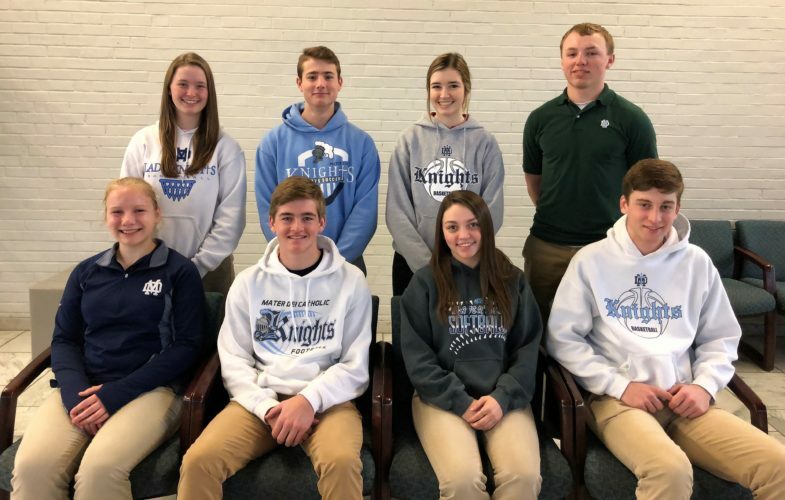 The administration and faculty are pleased to announce the Students of the Quarter for the third quarter of the 2018-2019 school year: (front, from left) freshmen Josie Przygoda and Jacob Patton, sophomores Sarah Lipski and Alden Moss; (back, from left) juniors Madeline Strieker and Andrew Tasker, and seniors Alexis Patton and Blake Sellers.